I first got to know Shawn Smucker close to a decade ago when we were both struggling bloggers. Shawn had been at it for longer than I had (my blog at the time has long since been abandoned, so don’t go looking for it. Please.) and kindly boosted my platform by trading guest posts. I appreciated his welcoming kindness at the time, and I’ve appreciated his honest and sincere writing ever since. 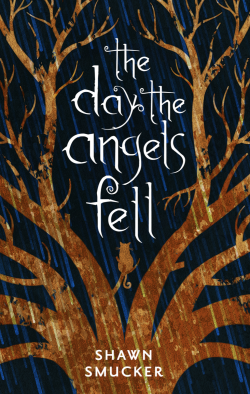 Shawn’s first young adult novel, The Day the Angels Fell, is being published this month, and he recently took some time to talk with me about his influences, the inspiration for his book, and how death and grief inform our perspective on life. David Nilsen for Fourth & Sycamore: Whether by intention or happy accident, The Day the Angels Fell seems to be in conversation with the works of two authors who wrote young adult novels before there was even a young adult market: Madeleine L’Engle and Katherine Paterson. Both bring the fantastic into the realm of the every day, both work with Biblical imagery and mythology without sinking to propaganda, and both take grief as a theme in their best known works, all of which finds echoes in your debut novel. Were those authors conscious influences? How would you say your book interacts with that old guard of Christian-influenced youth fiction? Shawn Smucker: L’Engle is certainly an influencer in my writing life. A Wrinkle in Time became one of those books I circled back to again and again as a teenager, and then as an adult. Paterson not so much, although I’m sure Bridge to Terebithia guides my pen in subconscious ways. I do like to think of it as a conversation, the way books can interact from generation to generation. So, while in their books death played a particular role, in my book the question is raised, “But could it be possible that death is a gift?” And I think their books both hold answers to that, in some regard, or perhaps reply with their own questions. F&S: Who are some other authors who have inspired and influenced you? Shawn: I think in the most conscious sense, the biggest influencers on the writing of The Day the Angels Fell were Madeleine L’Engle and Neil Gaiman. I had only just recently discovered Gaiman prior to writing this, having read The Ocean at the End of the Lane, and the way he interjects magical realism into his stories seemed fun to me, something worth exploring in my own writing. Others? Tolkien, Lewis, Rowling, Robinson. I guess the list goes on and on, and in no way do I think I’ve attained that level of artistry yet, but they certainly leave bread crumbs to follow. F&S: Grief and loss are the heart of this book. Was that a personal theme you were exploring when you were writing this? Photo of Shawn Smucker by John Sanderson of Sanderson Photography. Shawn: I had just returned from Turkey where I was co-writing a book with a man dying of cancer. He only had months to live, and spending time with him and his family in those final days had a huge impact on me in a very personal way. I thought a lot about my own mortality in those days. When I came home from the trip, I knew I wanted to write a story for my children, and as that story unfolded, death became the main theme. It wasn’t something I set out to do—write a book about death—but it’s what I was dealing with personally, and it’s what came out. F&S: You’ve taken an unusual publishing path toward your debut novel. Can you tell me about your writing career prior to the publication of The Day the Angels Fell? Shawn: Yes. I started my career in 2008 as a co-writer, and that’s pretty much what I did for the next six or seven years, co-writing memoirs and family histories and that sort of thing. It wasn’t until 2014 that I self-published The Day the Angels Fell, and it wasn’t until 2016 that the book was picked up by a publisher. I am 40 years old and feel like I’m only getting started. F&S: In the book’s acknowledgements, you say your kids helped you create this story around the dinner table one Spring evening. Can you tell me more about that and the role your kids have in your artistic inspiration? Shawn: When I got back from Turkey, one night at dinner I asked them what kind of a book they’d like and if they’d help me come up with the plot. What we created together that night wasn’t exactly what the book would become—there were, in the beginning, more talking animals—but the idea of a story that continues an old tale, includes a child whose mother has died, and is quest-like in nature were all things we came up with together. F&S: The Day the Angels Fell succeeds at capturing the experience of rural childhood with its freedoms and unique fears. I assume that was drawn from your own childhood? What was your upbringing like? Shawn: When I was the age of Samuel, I lived on a farm in central Pennsylvania. It really was such a wonderful place to grow up. As soon as I got home from school, I’d be out in the barns or the fields or down at the creek or playing in the cemetery. To have that kind of space and freedom as a young boy is extraordinary. My parents always kept me in books, and I spent as much time, if not more, sitting on the porch reading as I did carrying out my own adventures. I am very fortunate to have had that kind of childhood. F&S: You’re a person of faith, but I know from previous conversations you’re aware of the failings of much popular Christian “art” in recent decades. What does it mean for you to be writing stories influenced by faith but still honest about the human heart and true to artistic impulse? 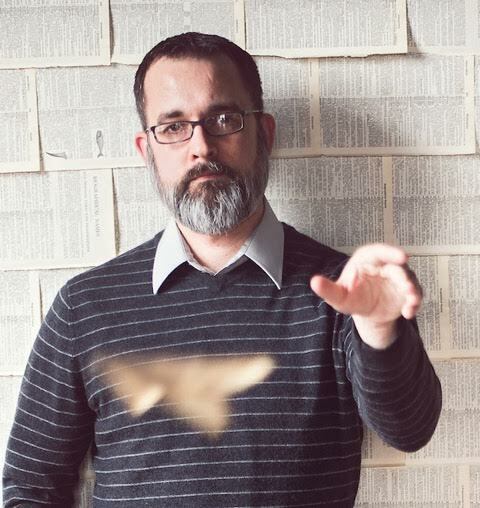 Shawn: First and foremost, I do not set out to write novels for Christians. My goal is to tell a good story, a “True” story. I think you hit on the key word in your question: honesty. If I try to curb a character’s impulses based on what I think might be “acceptable” to a Christian reader, I have failed as an artist. If I try to shape a plot, not based on where the characters are taking it but based on some preconceived message or agenda, I have failed as an artist. So, even though I am currently published by a Christian publisher, I do not take that into consideration when I write. To me, a story must, at all costs, be honest. It must tell the Truth. Of course, I’m not talking historical accuracy here, because I’m writing novels, but I’m talking about a Truth that takes into account the way the world is and the way we so desperately want it to be, and the horrible and wonderful things we will do to create that world we want. F&S: What’s next? I understand you’re planning a second book in this series for next year? Do you have other book projects in the works? Shawn: There is a sequel to The Day the Angels Fell that comes out early next summer, called The Edge of Over There. I love this next one so much. It focuses more on Abra and her taking up the mantel from Mr. Tennin. I’m also working on a nonfiction, memoir-style book that explores the relationship my family has developed with a Syrian refugee family, what they went through to get the U.S., and how they have influenced me and the way I view “outsiders.” This book is slated for a Fall release in 2018.